The weather over the holiday weekend didn’t exactly cooperate and I found myself with just a short break in the rain to do a rack of ribs. I had been planing to do the rack with the 2-1-1- method, but it didn’t look like I had that kind of time. So I kept the technique, but bumped up the temperature to shorten the cook. Set your grill up for a raised direct cook at medium-ish heat (325°F). On the Big Green Egg this meant barely filling the fire ring with lump charcoal and using an extender to raise the cooking grate further from the heat. 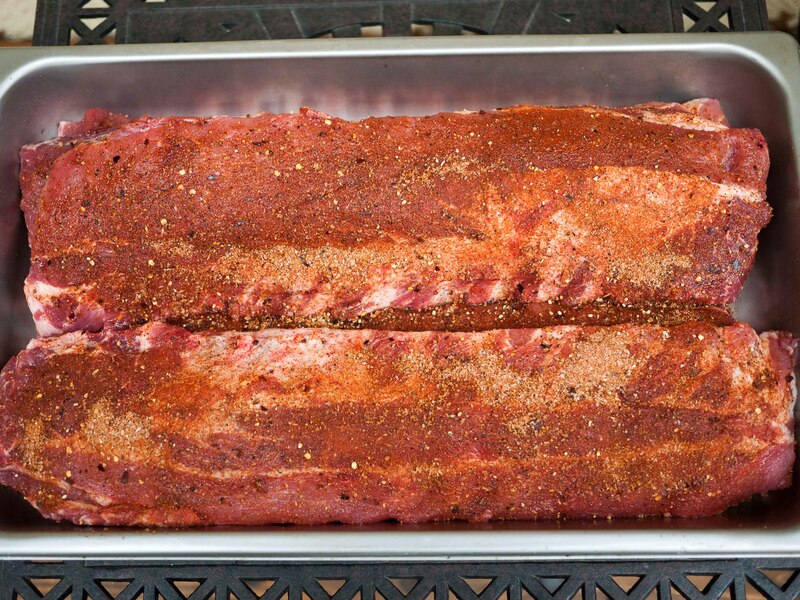 While the grill is heating up, dust your ribs generously on both sides with rub (Dizzy Pig’s Dizzy Dust in this case). When the grill is ready, add your smoking wood (guava this time) and wait until the smoke turns from white (bad) to blue (good). Than arrange your rack on the cooking grate bone side down. Close the lid and let them cook for 2 hours. Lay out a sheet of heavy-duty foil big enough to wrap the rack in and pour 1/4 cup of barbecue sauce (cheap store brand this time) down the middle of it. Put rack on foil meat side down. Wrap tightly and return to grill for 1/2 hour. Remove ribs from foil and put back on grill meat side up. Sauce ribs and let cook another 1/2 hour, until meat has pulled back from the ends of the bones and is very tender. I was afraid the extra heat would dry out the ribs, but they were tender and tasty. Funny thing is that I was in such a rush to get the ribs on that I forgot to remove the membrane on the bone side. Normally this is a no-no as it can get tough and unpleasant to eat, but the extra heat crisped the membrane to the point that it was almost like skin on a chicken. It gave a nice extra bit of texture and it seemed like it helped to hold the juices in. I did have to dock myself 1/2 a star for the store-bought sauce. Not a winner. Not really ribs, country-style ribs are thick slabs of meaty goodness cut from the shoulder of the of the pig. It’s a complicated cut of meat with lots of fat and connective tissue, so they really lend themselves for a little low and slow smoking followed by by a braise until they melt. Season ribs on all sides with a generous coating of rub (Plowboys Yardbird in the case). Stash in fridge while you set up the grill. Set the grill up for an indirect cook over medium (300°F) heat. On the Big Green Egg is used the plate settler to diffuse the heat and raise my cooking grate about 4 inches. 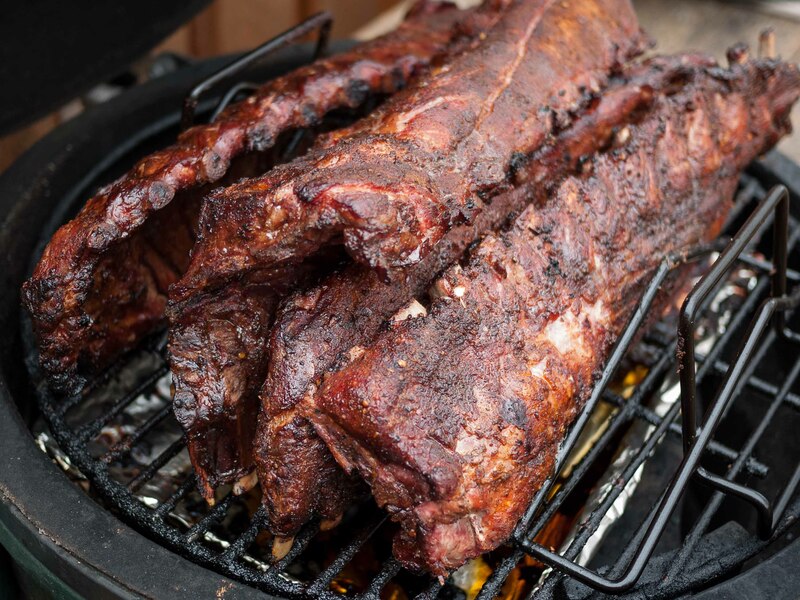 Add your smoking wood (apple this time) to the grill and when the grill reaches 300°F and the smoke has turned blue, add a drip pan to the plate setter, and arrange the ribs on the cooking grate. Close the lid and let them cook, flipping every 30 minutes, until they reach 160°F internal (about an hour and a half). 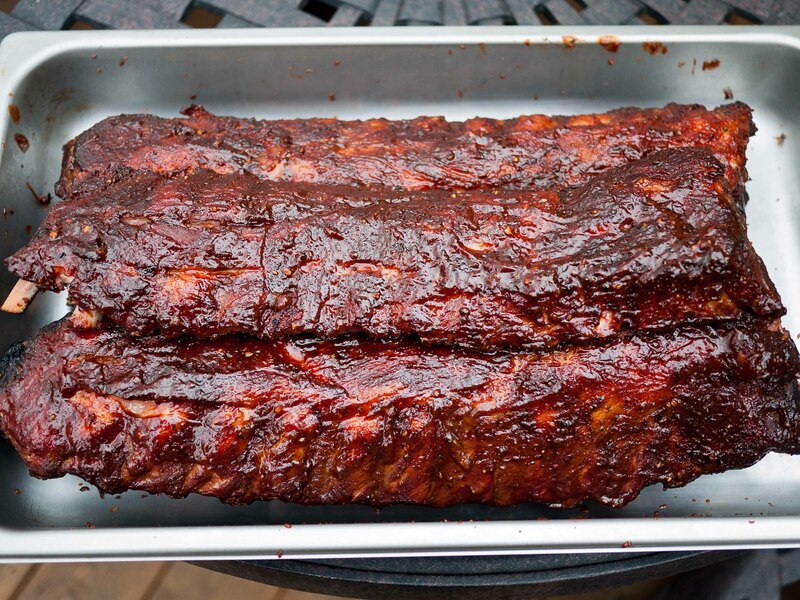 Move the ribs off to a flame-proof pan roasting pan and cover with the apple juice. Turn ribs to coat and move the pan full of ribs back to the grill. Close the lid and let cook for an hour. Check the ribs for doneness – they should be around 190°F internal and the meat should fall apart when you poke at it with a fork. Remove the ribs to a platter to let them rest. Reserve any juices that are still left in the pan. 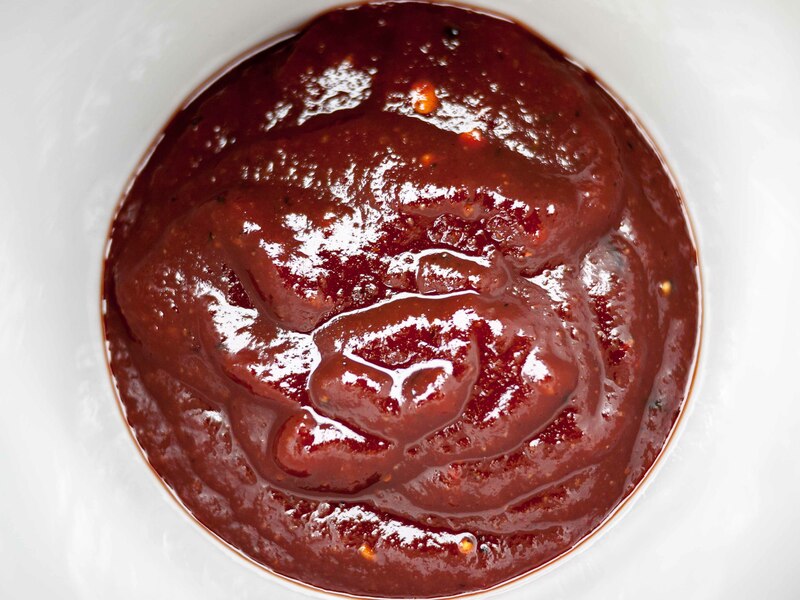 Pour reserved juices and barbecue sauce together in a small sauce pan. Bring to a boil, then reduce heat and let simmer for 5 minutes to thicken. Serve the ribs with sauce on the side. Very tasty – really like the extra sweetness from the apple juice, but not as juicy as I would have liked. I think these might benefit from being sealed in foil for the final part of the cook. This is a perfect recipe for Sunday supper. You get a nice meal out of it plus plenty of leftovers for the rest of the week. Combine the salt, herbs, and spices in a small bowl. Prep the chicken by removing the giblets and trimming off any excess fat or skin. Gently loosen the skin around the breast and thighs. Use a spoon to scoop about half the rub under the skin, spreading it out evenly. Dust the outside of the bird with the remaining rub. Move the chicken to a pan with a rack in it and stash uncovered in the fridge for at least an hour (overnight is even better) to let the skin dry out a bit and the rub do its magic. Set up your grill for an indirect cook over low (300°F) heat. On the Big Green Egg I used an inverted plate setter (convEGGtor) to defuse the heat. Add a little wood for smoke, but go easy because chicken will soak up a lot of it. I used a small hunk of apple. Roast the chicken until the breast hits 165°F internal (about 1 1/2 hours). 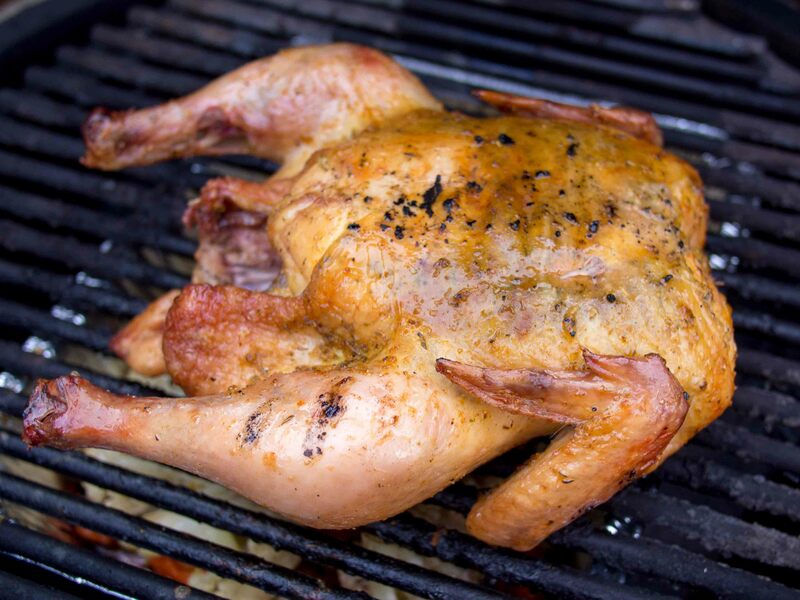 Remove from grill and let rest 10 minutes before carving. Lowering the roasting temperature gave more time for the smoke to flavor the bird while still keeping the skin crisp. Leftovers became a chicken and kielbasa stew. I spent New Year’s Eve alone this year :(. I still wanted to celebrate surviving another trip around the sun, so I hunted up a small prime rib roast and tried my hand yet again at a reverse sear. With prime rib, you want to maximize the amount of medium-rare meat from edge to center and still have a nicely browned, flavorful crust. This can be a bit tricky because most traditional roasting techniques end up overcooking the outermost layers, leaving you with a wide band of gray and dry meat. The reverse sear avoids this by cooking the meat slowly until it’s just about medium rare, then pulling it out to rest for 30 minutes while you crank the heat up as high as it’ll go. Then searing the roast until the outside is brown and sizzling, but not so long that you start to cook the inside. Prep the roast at least a day in advance. Score the deckle (fat cap by making shallow diagonal cuts in a diamond pattern at about 1-inch intervals. Generously dust the roast on all sides with the steak seasoning and plenty of salt, making sure to work it into the cuts. If the roast is too oblong, tie if up with butcher’s twine to get it more round and compact. This will help it cook more evenly. Stash in the fridge overnight. Set your grill up for an indirect cook over low (250°F) heat. On the Big Green Egg this meant using the plate setter (convEGGtor) inverted with the legs up and a drip pan to diffuse the heat. When the grill is ready add a little wood for smoke. I use a mix of apple and a little mesquite. to keep an eye on both grill and internal meat temp. Remove from the grill and let rest someplace warm for 30 minutes. 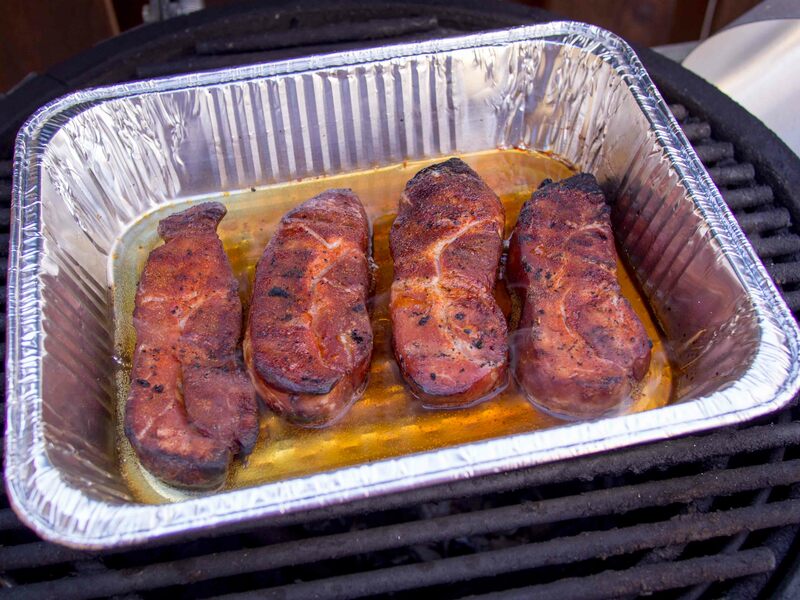 While the meat is resting, crank up your grill as hot as it will go while still keeping the indirect setup. I got the Egg up to just a bit shy of 700°F. Return the roast to the grill for 5-10 minutes, just long enough to crisp the outside. Perfectly rare/medium-rare with a crispy crust and not a titch of gray to be seen. The smoke added a little bite to the meat that helped to offset the richness. Now that I’ve got this reverse sear figured out I’m going to be using it a lot more. For you food geeks – I took the roast off the grill when it hit 118°F Internal. The temp rose while resting to 123°F then dropped to 122°F. There was less than a tablespoon of juices lost on the cutting board and the meat was so juicy that there were little pools of standing juice on the slices. The sear only took 5 minutes as was so intense that at the end the little fat in the drip pan got so hot it ignited. For a lot of folks, St. Paddy’s Day is an excuse for the wearin-o-the-green and the puking-on-the-shoes. For me, it’s a great chance to pick up some cheap brisket and make up a big batch of pastrami. I know it’s not traditional, but both corned beef and pastrami are corned (cured) brisket, right? 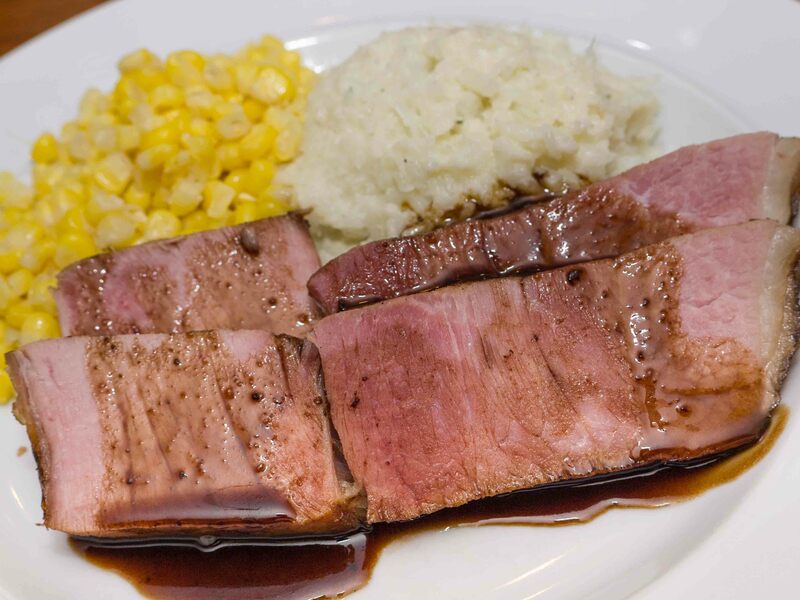 While corned beef is cured and then roasted, braised, boiled, and/or (sometimes) steamed, pastrami is cured and then re-seasoned before being smoked. I like plain corned beef too, but I think that the smoke adds a ton of flavor to the meat. Combine the Morton’s, brown sugar, and spices. Put the brisket in a large freezer bag and coat with the cure. Rub the cure into the meat, covering all sides. Squeeze the air out of the bag, seal, and stash in the fridge for 7 days. Liquid will begin to collect in the bag almost immediately. This is your curing solution. Do not drain it off. Flip the bag over once a day to distribute the cure evenly. After a week, remove the brisket from the cure and rinse under cold water and then soak for an hour to remove some of the salt. Dry off the meat and season with a Montreal-style steak seasoning. Set up your grill for an indirect cook that will burn for at least 5 hours at 300°F. Use a drip pan under the brisket to catch the fat. Add wood for smoke (I like grape vine). Cook brisket fat side up at 300°F for about 3 hours, or until the internal temperature of the meat hits 160°F internal. 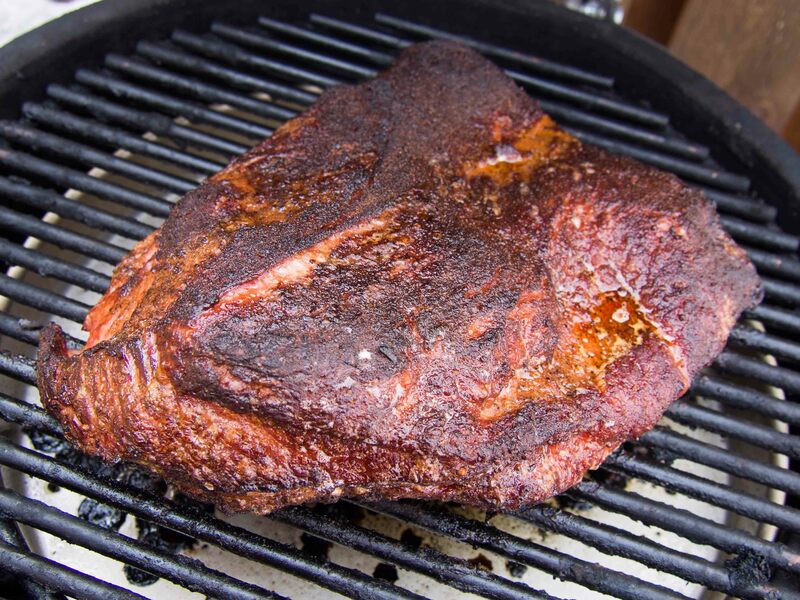 Remove the brisket from the smoker and wrap tightly with several layers of heavy-duty aluminum foil. Return meat the the grill fat side up and cook for about another 2 hours, or until the meat hits 190°F internal. Remove foiled brisket from the grill and let rest for 20 minutes. 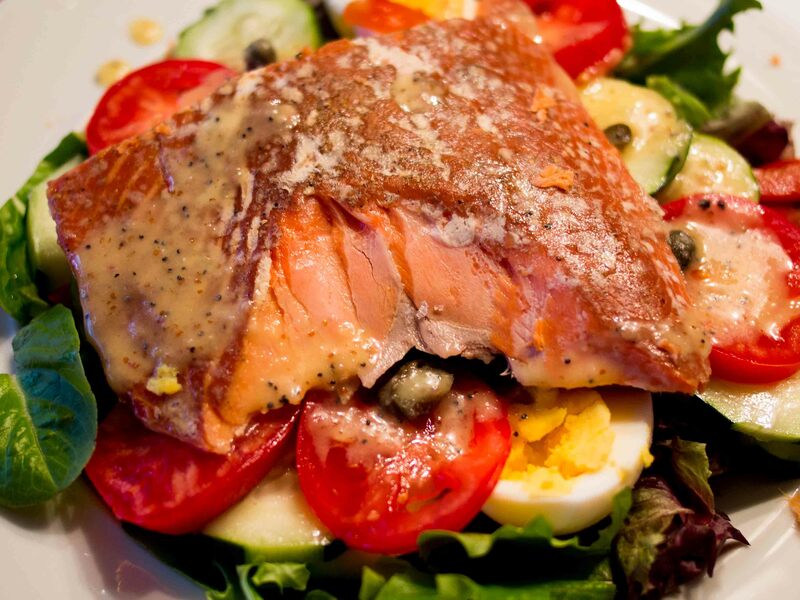 Carefully remove the foil (steam burns can ruin your day), reserving any juices that have accumulated. Slice the pastrami thinly against the grain to serve. We have a winner! I served it hot-off-the-grill with home-made sauerkraut and stone-ground mustard. Very tasty. The rest will go into pastrami reubens with melted Munster cheese and Russian dressing. Anything left over after that will become dip. Author DavePosted on March 14, 2014 Categories Beef, Cured Meats, Smoking2 Comments on St. Paddy’s Pastrami?!? When we ordered our last pig, we got something I hadn’t seen before – ham roasts. Not a full ham, but more like a really thick cured and smoked ham steak. Normally I’d pan fry one of these for ham and eggs, or chop if up for ham and bean soup. Instead I decided to treat it like a regular ham and gave it the double-smoke and glaze treatment. Combine the honey, vinegars, Worcestershire sauce, and spices in a small sauce pan. Bring to a simmer over medium heat. Let simmer until it thickens enough to coat the back of a spoon – about 5 minutes. Remove from heat and set aside. Set your grill up for an indirect cook over medium heat (350°F). On the Big Green Egg this means using an inverted plate setter to diffuse the heat, and a trivet to set the pan on. I added a good-sized chunk of pecan wood for smoke. 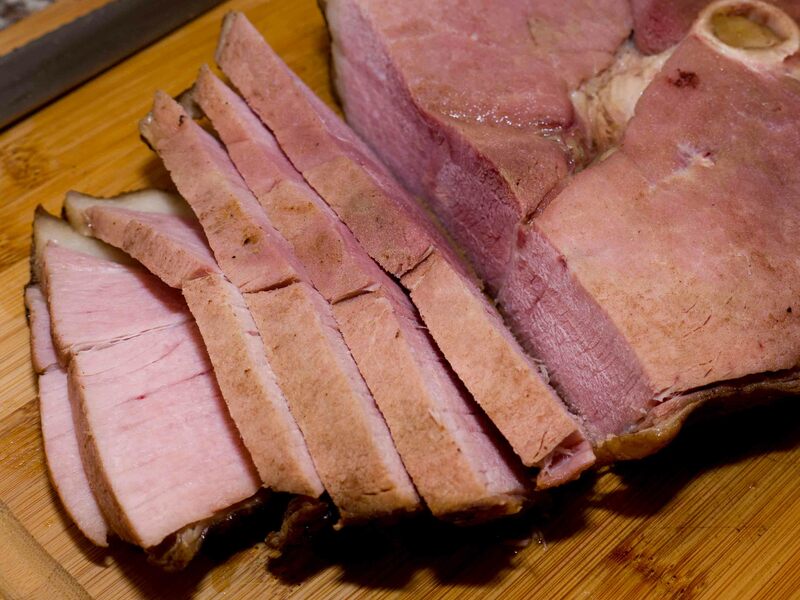 On fully cooked hams, all you need to do is warm the ham to 140°F internal. At 15 minutes per pound, this 3 pound roast should take less than an hour. Place the roast in a small roasting pan (I used a 9×13 cake pan). Close the lid and cook the roast for 20 minutes. Flip the roast over and baste the ham with the glaze. Close the lid and cook for another 20 minutes. Glaze again, and continue cooking until the ham reaches 140°F internal. Glaze one last time and remove to a cutting board. 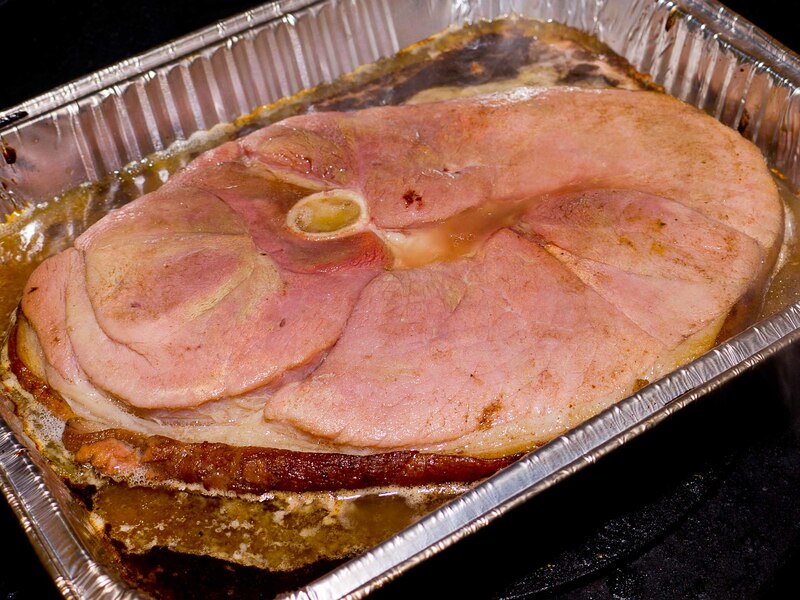 Let the ham rest 10 minutes before slicing and serving. Skim the fat off the pan juices serve it as an au jus. 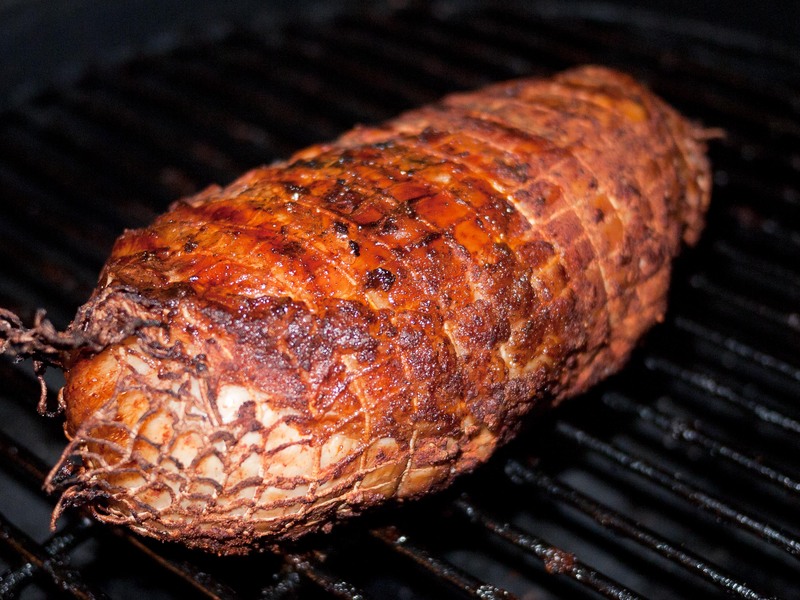 Cooking ham is easy, and double smoking and glazing the roast like this is a great way to really bump the flavor up without adding much more effort to it. This cut got a little dry, but that was the only problem. Next time I would probably glaze it right before putting it on the grill and then eery 15 minutes or so until just done. Ham is 130 calories and 4 Weight Watchers points per 3 ounce serving. I had such nice results using Plowboys Yardbird Rub on chicken, that I just had to take them up on their “Created for Chicken but Made for Pork” tag line and try it on some baby-back ribs. I went with a very minimal prep of the ribs, just removed the membrane on the bone side of the ribs and rubbed in a generous coating of Plowboys Yardbird Rub into both sides of them about an hour before they went on the Big Green Egg. 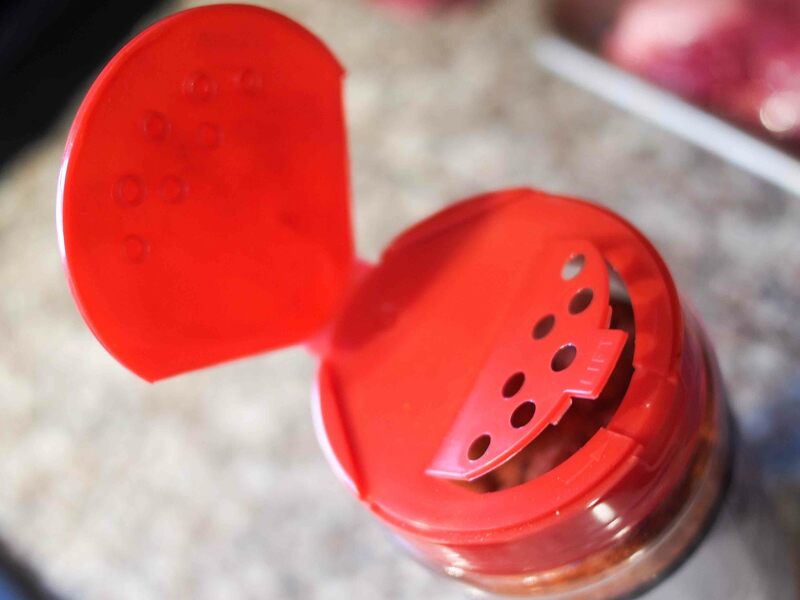 I have to say that whoever designed the jar for this rub is a genius – 14 ounces, so you’ve got plenty of rub to work with, and then this dual-function top has both big holes for easy shaking and a larger flap that lets you get a measuring spoon in there. Very nice. I set up my grill for an indirect cook at 250°F. I filled the firebox with lump charcoal and used an inverted plate setter to diffuse the heat and a drip pan with a little water in it to catch the fat. I lit the charcoal just in the center, and once the temperature hit 250°F in the dome, I added a couple of chunks of apple wood for smoke. When the smoke changed from white (bad) to blue (good) I loaded up the ribs bone side down on the grate and let them cook for an hour. I flipped the ribs bone side up and then let them cook for 2 more hours. After the ribs had been on for 4 hours total, I started checking for doneness. 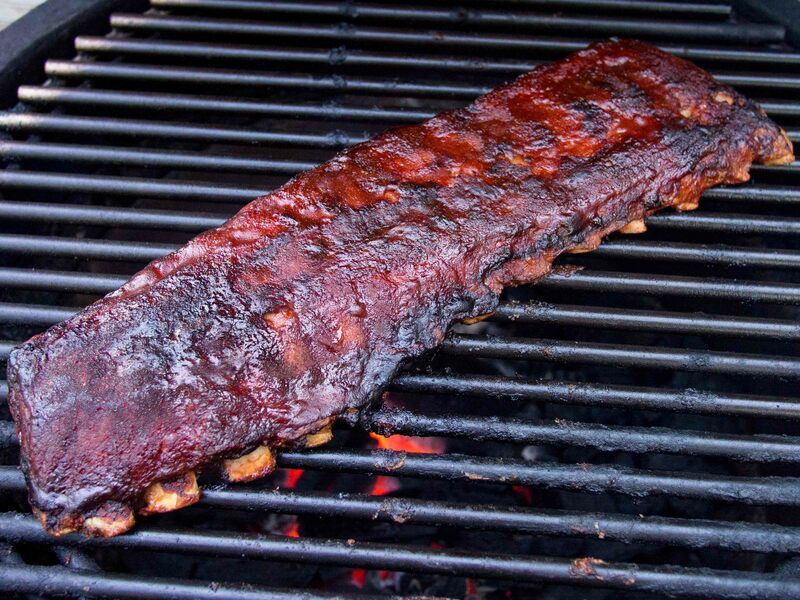 Ribs are generally done when a full slab will almost fold in half and start to crack when you pick up one end with a pair of tongs. These weren’t quite there yet. I gave them another 30 minutes and checked again. The meat had just started to pull back from the end of the bones, but a gentle tug on a couple of bones showed that they weren’t ready to come apart yet. I gave them another 30 minutes and checked again – much better. I brushed them with a thick coat of Honey Hog Barbecue Sauce and let them cook for another 15 minutes. I sauced them lightly again, cooked them for another 15 minutes, then removed them from the smoker and let them sit 10 minutes before serving. The Plowboys Yardbird rub stood right up to smoke and the porky goodness of the ribs. In fact, it may be better on pork than on chicken. What I’m really liking about this rub is how it disappears – like a good background singer – you don’t hear them but you would sure miss them if they were gone. The rub enhances the natural flavors without getting in the way. Why not a 5? We had a high of 6°F the day I cooked these, and the darker and colder it got the more those ribs sure looked like they were done. My bad. Another 30-45 minutes and they would have rocked. Ribs will never be diet food, sorry, but I think I burned off most of the calories with all the shivering I did. 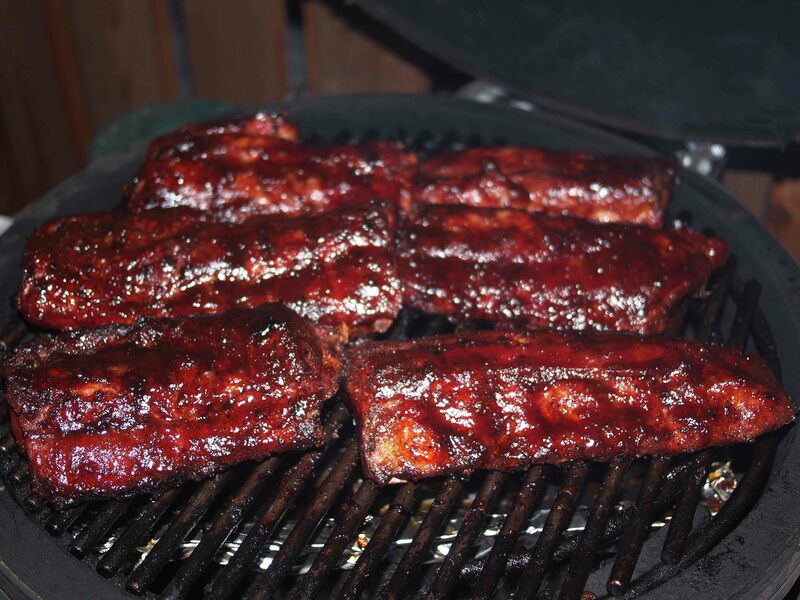 I recently had the opportunity to cook up a mess of barbecued baby back ribs for some friends. The only kicker was that we were to bring them over to their place. No problem. The ribs need to be almost fully cooked, travel for 30 minutes, and finish cooking in our friend’s oven. Since I wanted to make sure there were leftovers for everyone, I figured on one rack of baby backs per adult, so 5 racks total. When the Egg was up to temp, I added both a plate setter and a drip pan to diffuse the heat and keep the ends of the racks from burning. I added a little hickory wood for smoke and when it burned clean I loaded up the ribs. This is more ribs than I’ve ever tried on the Egg, and an inverted roasting rack really came in handy to keep the ribs from crowding each other so they’d cook as evenly as possible. I let the ribs cook for an hour and then flipped the racks end for end. I let them go another hour and then rotated the whole roasting rack 180°. I let them go an hour and a half undisturbed, then moved them out of the rack and onto the grate and sauced them. Combine all ingredients in a medium sauce pan. Stir to combine and bring to a simmer over medium heat. Cook until all the sugar has dissolved and the sauce starts to thicken a little bit (about five minutes). I sauced the racks fairly heavily and let them cook for another 30 minutes. I then sauced them one more time and moved them to a large baking pan. I sealed the pan up with 2 layers of heavy-duty aluminum foil and we hit the road. Once at our friend’s house, the ribs went into a 350°F oven for an hour. I have to say that I am really liking General Purpose Rub v1.5. It’s got a lot of flavor, a bit of heat, some herbiness, and it all works well together. The Honey Hog Barbecue Sauce v2.0 is also a winner, with all the goodness of the rub plus a tangy, almost fruity, sweetness. The ribs? They were tasty, but they were big baby backs (average 2 1/2 pounds per rack) and I overestimated how much they would cook in the foil while being transported. They ended up good, but chewier than I would have liked. On the plus side, a rack per adult was way too much food, so we all enjoyed leftovers. Ribs never will be diet food. A four bone serving is 600 calories and 10 Weight Watchers points with the rub and the sauce. I hope everyone had a happy Thanksgiving! We traveled to see family, so I had one of those rare meals where I got to be a guest. All I had to do was bring a side dish and carve the bird. It was a very relaxing trip. When we got back, my dear wife wanted just a little Thanksgiving dinner for the two of us, so I decided to try a boneless turkey breast. I set the Big Green egg up for an indirect cook at 300°F using an inverted plate setter to diffuse the heat. While the grill was coming up to temp, I dusted the breast heavily on all sides with the barbecue rub. 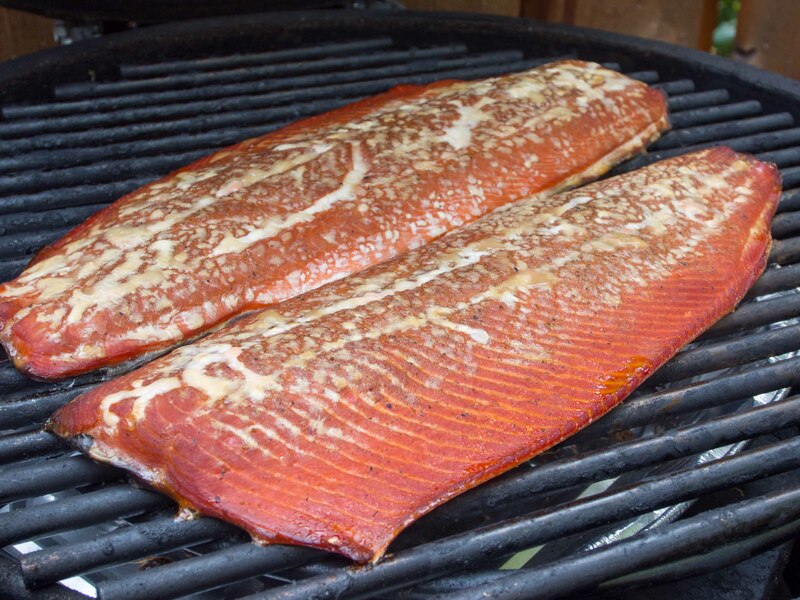 When the grill was ready, I added a chunk of pecan wood for smoke, and when the smoke turned from white to blue, I loaded the breast on the grate. I cooked the breast, turning every 30 minutes, until the internal temp hit 155°F – about 1 1/2 hours total. I moved it off to a cutting board and let it rest for 15 minutes before removing the netting and slicing. 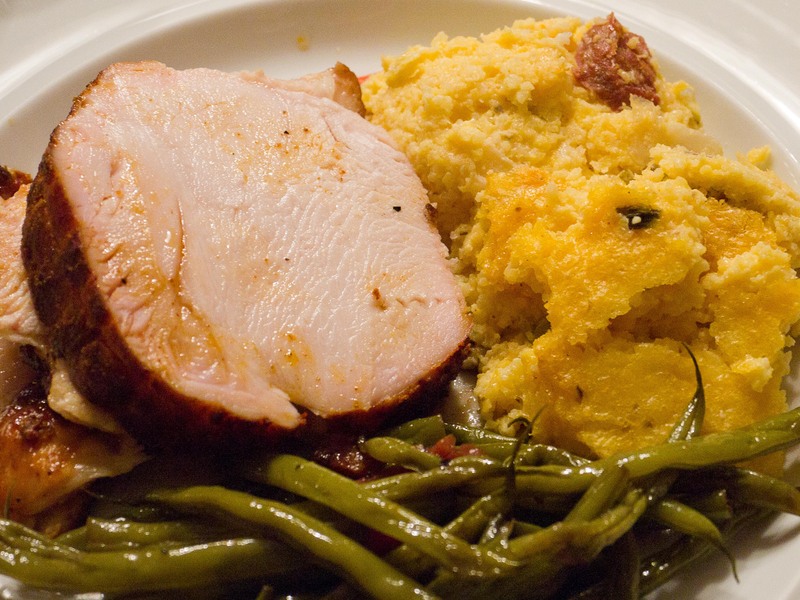 I served the turkey up with some sautéed green beans and the polenta dressing left over from our big family meal. 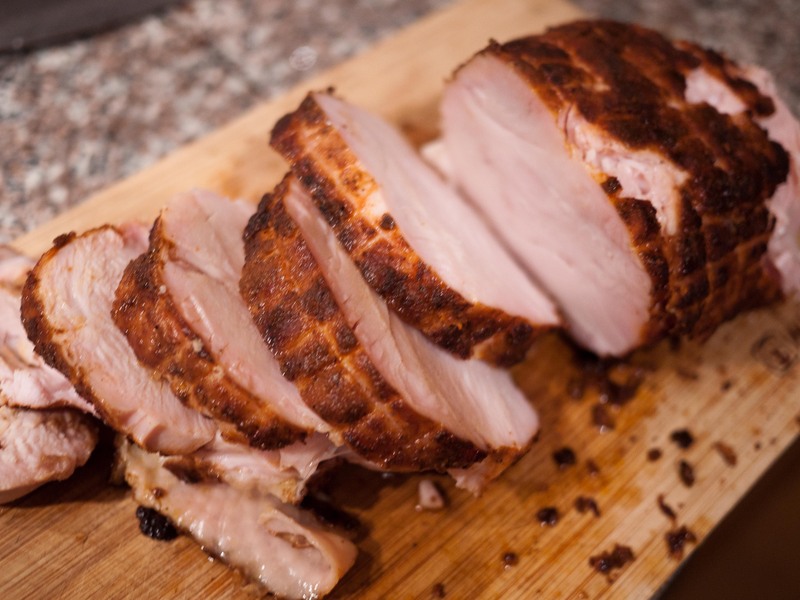 Very tasty – the turkey picked up a lot of the flavor from the smoke and the rub and was nice and juicy. I’m thinking about doing up a couple more of these and then running them through the meat slicer for sandwiches. To keep the costs down, I’m probably going to have to learn to bone and net my own bird. This video shows how to do it with a leg of lamb, but same idea. 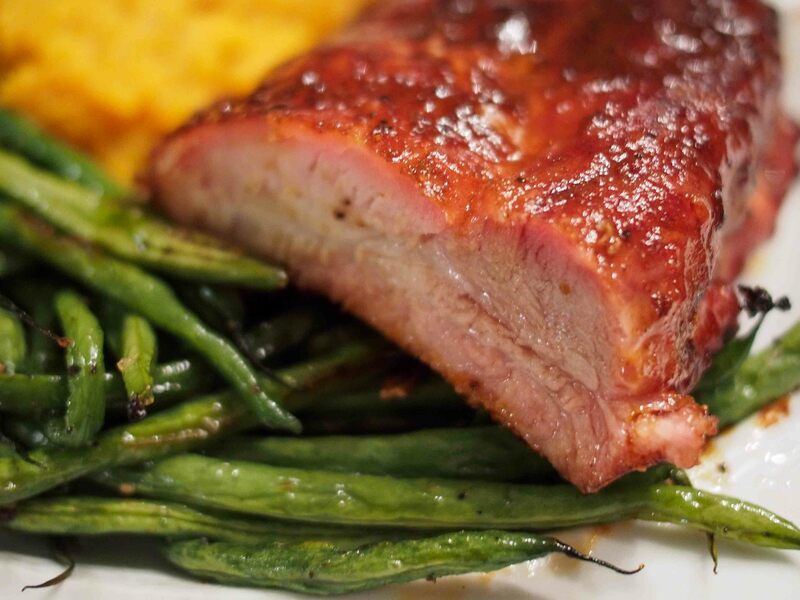 If we’re just talking about the green beans and the turkey, life is good – 3 ounces of skin-on turkey breast is only 2 Weight Watchers points and the green beans are (mostly) free. Dare not, however, try to figure out the points for the dressing. I did and it made the poor little points calculator cry. Definitely a dish for special occasions.